Read our second report in partnership with Boston Consulting Group (BCG)! Deep technologies — novel technologies that offer significant advances over those currently in use — are attracting an unprecedented amount of interest and activity. The aggregate global private investment in seven deep tech categories researched by BCG and Hello Tomorrow soared by more than 20% a year from 2015 through 2018 to reach almost $18 billion. Deep tech is no longer the primary purview of deep pockets — or of the scientific community. A number of trends have brought us to a point of major change in how deep tech research is pursued and how new technologies are brought to market. Innovation is a much more fragmented and diverse endeavor than ever before — geographically, functionally, and industrially. Some suggest that we are at the beginning of a new cycle that could carry R&D for the next two to three generations or that we may be shifting from the end of one cycle, a “deployment” phase — which has been mostly about building applications that are based on existing information and communications technologies — to the beginning of an “installation” phase in which new technology infrastructures are constructed. Clearly, a new deep tech ecosystem is taking shape, with big ramifications for all players, most notably companies, investors, and startups. DEEP TECH IS NO LONGER THE PRIMARY PURVIEW OF DEEP POCKETS — OR OF THE SCIENTIFIC COMMUNITY. Two previous publications by BCG and Hello Tomorrow examined the business prospects for emerging technologies. (See “What Deep-Tech Startups Want from Corporate Partners” and “A Framework for Deep-Tech Collaboration,” articles by BCG and Hello Tomorrow, April 2017.) 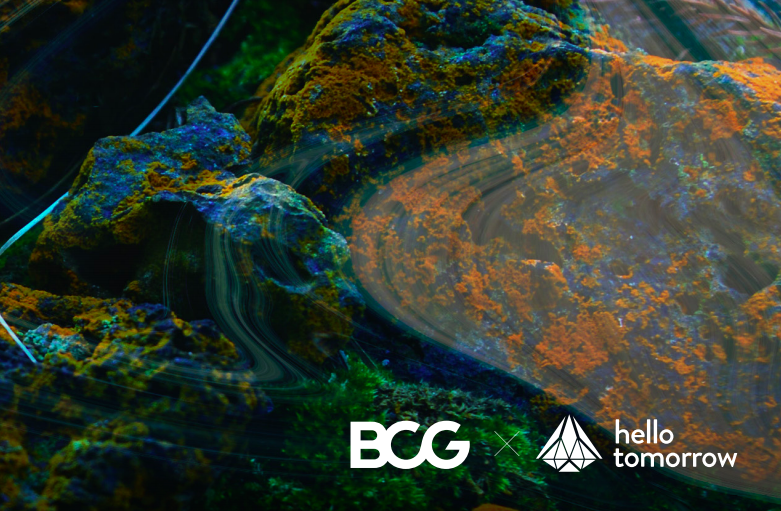 In the past year, BCG and Hello Tomorrow researched seven fields of deep tech endeavor and the roles of multiple types of deep tech ecosystem participants to gain a better understanding of how companies are conducting R&D in emergent technologies today. The seven fields — advanced materials, artificial intelligence (AI), biotechnology, blockchain, drones and robotics, photonics and electronics, and quantum computing — constitute the most active and promising deep technologies and span the spectrum from very early research to market applications in full development. They therefore provide a representative picture of the deep tech landscape. We relied on in-depth interviews, market research, examinations of funding, patent and publication data, and exclusive data from more than 2,000 deep tech startups. The resulting report, The Dawn of the Deep Tech Ecosystem, tours the evolving ecosystem and offers observations on how the different types of participants can maximize the value of their engagement. It examines how corporations, investors, and startups active in deep tech need to think about their roles in the future. This article presents a summary of our findings and conclusions. Three attributes in particular characterize deep tech in a business context. These technologies can have a big impact, take a long time to reach market-ready maturity, and require a significant amount of capital to develop and scale. Innovations based on deep tech can generate enormous economic value, but their ultimate impact extends far beyond the financial realm to everyday life. Hello Tomorrow’s analysis of the 1,646 startups that qualified for its current annual Global Challenge, a startup competition that assesses deep tech startups on four criteria — technological innovation, business model, team skills, and expected impact — shows that these companies anticipate having an impact on a wide variety of the United Nations’ sustainable development goals (SDGs). The goal receiving the most attention is good health and well-being (51% of startups), followed by those related to industry, innovation, and infrastructure (50%) and mitigating human impact on the environment (sustainable cities and communities — 28%, responsible consumption and production — 25%, climate action — 22%, affordable and clean energy — 18%, and clean water and sanitation — 10%). Deep tech takes time to move from basic science to a technology that can be applied to actual use cases. (Indeed, the incorporation of a startup is not the beginning of the story but a milestone in the development of a technology, when the science has been proven and the work starts to target a particular market.) The amount of time varies substantially by technology, though it is almost always longer than the time needed to develop an innovation based on a widely available technology (think of a new mobile application). Analysis of the startups in the Hello Tomorrow Challenge shows that it takes 4 years on average to develop a technology in biotech (1.8 years from incorporation to first prototype and another 2.2 years to reach the market), while the comparable figure is only 2.4 years for a startup in blockchain (1.4 years to first prototype and 1 year to market). The wild card is the technology itself, as each advance seems to speed the next. The funding needs of deep tech companies vary significantly with the technology. For example, data from Hello Tomorrow’s Challenge participants shows that developing the first prototype in biotech costs an average of almost $1.3 million, but in blockchain, it costs only about $200,000. Several factors complicate tech investment. One is market risk. Many companies are seeking funding in the early research phase, long before they can put a product or even prototype in the hands of potential customers, meaning that investors have few if any KPIs with which they can evaluate traction and market potential. Another complicating factor is technology risk; many investors don’t have the specific expertise in-house that they need to accurately assess the potential of emerging technologies. As a consequence, deep tech startups rarely follow the established funding progression of other types of young tech enterprises — seeking money from friends and family, then angel or seed investors, then successive rounds of venture capital investment at increasing valuations (which validate the decisions of previous investors), leading ultimately to a trade sale or an IPO. In deep tech, public funding plays an important role in the early phase, and friends-and-family money is rarely significant relative to the substantial capital requirements of early R&D. Private-public financing schemes are becoming increasingly important to financing deep tech ventures along their entire life cycle, and corporate venture capital (CVC) funds, incubators, and accelerators also have become prevalent partners since they provide not only funding but other critical forms of support. There have always been aggressive and visionary scientists and entrepreneurs. What’s changed is the ability of these individuals to access technological capabilities, financing, and other critical resources to bring their dreams into the real-life lab and perhaps to market. The growing deep tech ecosystem facilitates research into almost any kind of technology, from things we can’t see to concepts that relatively few can explain. This ecosystem is rooted in a handful of trends. Innovation in the past few decades has been driven mainly by a few powerful platform technologies (silicon chips, desktop computers, the internet, and mobile technologies) that led to a wide variety of applications in many industries. Powerful new platform technologies are now emerging, paving the way for innovation in the next several decades. It’s happening simultaneously in software (machine learning), hardware (quantum computing), and biology (genetic sequencing and CRISPR-Cas9, which are reenergizing biotech). Their convergence multiplies their potential and creates the kind of momentum that drives new industrial revolutions. As new platform technologies rise, barriers fall. Today’s innovators have a wealth of technological capability at their fingertips. PCs are inexpensive and powerful, and even more powerful computing hardware is on offer from cloud-based services. Easy access to hardware obviates big upfront capital expenditures for tech. Likewise, software is both open-source and widely available as a service. Computer-aided design and manufacturing and 3D printing have revolutionized prototyping. In biotechnology, sequencing and synthesizing DNA have become standard services. At the same time, big corporations are diversifying their innovation programs, using CVC, incubators, and other venturing tools to gain access to new technologies. Research for this report shows that the number of private venture investments with CVC participation increased from 161 deals in 2015 to 203 in 2018, and the total value of private venture investments with CVC participation increased from approximately $3.2 billion in 2015 to $5.7 billion in 2018. In addition to their use of CVC, more and more large companies are deploying a variety of innovation investment and development vehicles, matching the tool to the circumstances (such as time to market) and their objectives (such as assessing new or disruptive technologies, improving existing technologies, or gaining control of a new technology). One result of this fragmentation and diversity of effort is that knowledge, skills, and information, while much more accessible, are also harder to harness because they reside in more, and more disparate, places — geographically, industrially, and functionally. This disparity is driving the need for new models of collaboration in basic R&D. There has been no shortage of venture capital in recent years. According to Crunchbase, global venture deal value approached $100 billion in the third quarter of 2018, up more than 40% over 2017. Deal volume also rose 40% during this period, coming close to 10,000 rounds. The capacity for startups to achieve new scientific and commercial levels of success has encouraged investors to infuse hundreds of billions of dollars into small companies. Our research shows plenty of funding activity for deep tech companies. (See Exhibit 2.) Both deep tech startups and more mature companies have attracted a greater amount of funding than other types of tech companies in the past five years. Deep tech companies have also completed more funding rounds. Some of the ready availability of capital must be credited to the macroeconomic conditions, however — most significantly, the unprecedented period of low (or no) interest rates following the 2008 financial crisis, which appears to be coming to an end. In addition, many believe that the already high, and still rising, valuations of many tech unicorns cannot be sustained. Venture funding, like other types of capital, runs in cycles, and we should not be surprised to see a pullback in the coming years. Governments around the world have undergone shifting roles in new technology R&D support, with the two biggest players, the US and China, moving in opposite directions. In the US, according to the American Association for the Advancement of Science, federal spending on R&D as a percentage of GDP dropped from more than 1.2% in 1976 to about 0.7% in 2018. In contrast, China is on an R&D tear. According to data compiled by the Economist, China’s spending on R&D on a purchasing-power-parity basis has risen about 400% over the past two decades to exceed $400 billion a year and compete with that of Europe and the US. UNESCO data shows that total spending on R&D in the US is equal to 2.7% of GDP, followed by China at 2.1% and the EU at 2.0%. The scientists and entrepreneurs working in deep tech are not put off by big problems — or the time and effort it takes to solve them. Indeed, for many, these problems are part of the attraction. Mitigating climate change, feeding 8 billion people, and keeping an aging population healthy are challenges that seem worth dedicating a career to — and also big markets that attract a lot of attention from startups, investors, and corporations alike. From R&D to industrialization and commercialization, deep tech today encompasses a broad ecosystem that includes multiple types of participants, each of which is active in one or more smaller ecosystems that is organized around a particular field of research, technology, industry, or mission. Business ecosystems are not new, of course, but deep tech ecosystems are nascent and operate in emerging — and therefore not yet stabilized — technologies and industries. As a consequence, they are a different breed and can be hard for traditional companies to navigate. Deep technologies also can affect entire value or supply chains and therefore require a more thorough analysis of the stakeholders’ interdependencies and value creation models in order to determine how to align goals, set strategies, and organize for interaction with others. Newcomers can find themselves in unfamiliar territory, and carving out a role can be complex, but they need to find their way. In many ways, startups sit at the center of deep tech ecosystems because they play an important role in speeding the research, development, and commercialization of the new technology or product and sometimes leading radical innovation that is too risky for incumbents. They are assisted in their efforts by a variety of other actors, with some playing multiple roles. Investors, for example, provide funding but often also offer expertise in corporate development and go-to-market strategies as well as high-level contacts. Likewise, corporate partners provide funding and a host of other necessities, not least of which is access to markets and potential customers. Universities can be important research partners, and facilitators (such as accelerators) frequently play a key role in helping startups develop other necessary relationships. DEEP TECH ECOSYSTEMS ARE HIGHLY DYNAMIC — PLAYERS COME AND GO, AND THEY CREATE NEW KINDS OF RELATIONSHIPS THAT ARE NOT ALWAYS FORMAL, DEFINED BY CONTRACTS, OR WELL SET. Deep tech ecosystems are highly dynamic — players come and go, and they create new kinds of relationships that are not always formal, defined by contracts, or well set. As the emerging technology or industry grows and matures, so do the relationships between the ecosystem’s stakeholders. Compared with early-stage startups, for example, mature startups in the commercialization phase need less technical, IP, and regulatory expertise and more visibility and access to the market. The attractiveness of various types of partners also shifts because startups turn to different stakeholders over time in order to gain access to needed resources. For example, the percentage of qualified startups in the 2018 Hello Tomorrow Challenge that are looking to corporate partners for help with product development drops from 38% to 24% between the experimental and the commercialization stages, while the percentage seeking assistance with product distribution rises from 24% to 47%. In addition, deep tech collaborations rely less on a central orchestrator and more on multifaceted interactions among participants. Even when an ecosystem has a strong player at the center (generally the one that brought the other parties together), rarely is any entity in complete control. The orchestrator’s role is more that of magnet than managing partner. Each partner can influence the direction of the whole, and alliances among participants can also shift the balance of power over key strategic questions. Ecosystem management can be as much an exercise in diplomacy and negotiation as business strategy and direction. And, while money is one important currency, it is far from the only means of exchange among participants. Knowledge, data, skills, expertise, contacts, and market access are also currencies that link ecosystem players. This means that traditional financial measures, such as revenues and profits, are not always the best means for assessing value realized. Deep tech ecosystems often involve relationships that are built around nontraditional, indirect, or nonfinancial linkages (involving data or services, for example) that push corporations, startups, investors, and others to develop new models for collaboration and remuneration. Ecosystem participants trade in a variety of currencies at the same time. How each participant approaches the ecosystem affects its ability to achieve value as well as influence others and the whole. Companies, investors, startups, and others should be guided strategically by three questions about themselves and their goals. WHAT DO WE BRING TO THE ECOSYSTEM? Since ecosystems operate on a win-win model, each participant needs to think about not only its own goals but the goals of the whole and how it can help the ecosystem advance a particular technology or market. The answer may be money, data, expertise, market access, or some other attribute. All participants need to contribute their currency, and make the ecosystem stronger, before they can realize their individual gains through commercial applications. WHAT DO WE WANT FROM THE ECOSYSTEM? All participants should be clear on why they are engaging with the deep tech ecosystem and what they hope to achieve. One answer for many, of course, is ROI, but the goals — and their associated timeframes — should be detailed with as much specificity as possible. Participants need to assess the value realized from all dimensions, not only financial ones. Since the monetization of technology in its early stages can be difficult to predict, participants also need to build use cases and assess their potential long-term value before developing business models. HOW DO WE INTERACT WITH OTHERS TO ACHIEVE OUR GOALS? Two characteristics of ecosystems require a rethinking of textbook management techniques, especially for more traditional participants. First, ecosystems are collaborative — they grow and strengthen through the continual interaction of all stakeholders toward a common end — and therefore the need for collaboration can trump more traditional competitive considerations. An automotive and an aerospace company might work with a startup on the development of next-generation batteries but so might two automakers, the startup, and a government agency because they all want the technology to come to market. Networks play an important role in collaboration because they foster the exchange of different ecosystem currencies. Second, deep tech ecosystems’ endgame and path of progress are highly uncertain. Any given idea, startup — or emergent technology — may or may not succeed. Traditional top-down strategy and R&D project management techniques need to be reinforced by methodologies designed to manage uncertainty. Different management approaches can provoke, foster, and increase the odds of the desired result, but they cannot engineer it. In such an environment, companies and investors should not think in terms of a single “bet” or “bets.” They need to engage with and nurture the entire ecosystem and look for the winning startups or technology to emerge from it. IT IS IN THE VERY NATURE OF DEEP TECH THAT MANY VENTURES WILL NOT SUCCEED, BUT ALL PARTICIPANTS CAN LEARN FROM FAILURES. Finally, all participants can learn from failures. It is in the very nature of deep tech that many ventures will not succeed. But they will almost always impart lessons that can inform the next initiative or collaboration. We are in the early days of the new deep tech ecosystem paradigm. Players, roles, and rules will all evolve as new discoveries are made and technologies demonstrate their potential. Perhaps the first rule for all would-be stakeholders is to set their goals and get into the game. Only then can they really learn — including from failures — and tap into the power and potential of the win-win ecosystem.